WARNING: DO NOT READ WHILE SIPPING EGG NOG. You know that time of year when you think you smell pine cones or holly-berries? Is that pumpkin? Ginger bread? Peppermint? or those peanut butter cookies with the chocolate kiss in the middle? It’s not what you think. There’s an angel passing over your head and he’s squeezing a duck. The Grinch has gone back up to Mt. Crumpet. Frosty went on vacation to Miami Beach and hasn’t returned. Rudolf, The Abominable Snowman and that elf who wants to be a dentist just gave up celebrating the holiday all together. Introducing your new favorite Christmas story. The one you read after the party…when the minister has gone home and the carolers are sipping their “special recipe” hot chocolate. 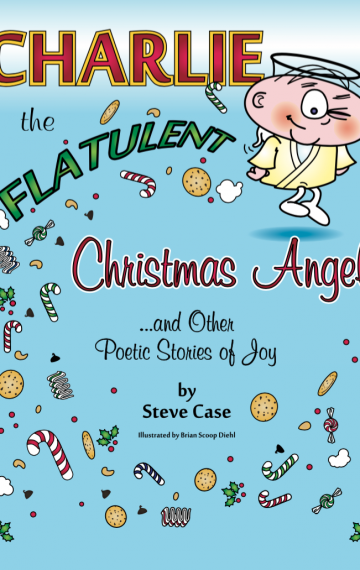 Charlie the Flatulent Christmas Angel is the heart-warming (cheek-flapping) story of the only angel to receive God’s special gift of methane melodies. Release your inner child like a one-cheek sneak as the angel with the fog-slicer takes the Christmas spotlight and lets the world know that Joy to The World is often best played on the trouser-tuba. Yes, gather your family around the fire (but not too close) as Charlie releases a squeaker of Christmas cheer.